OXFORD, Miss. 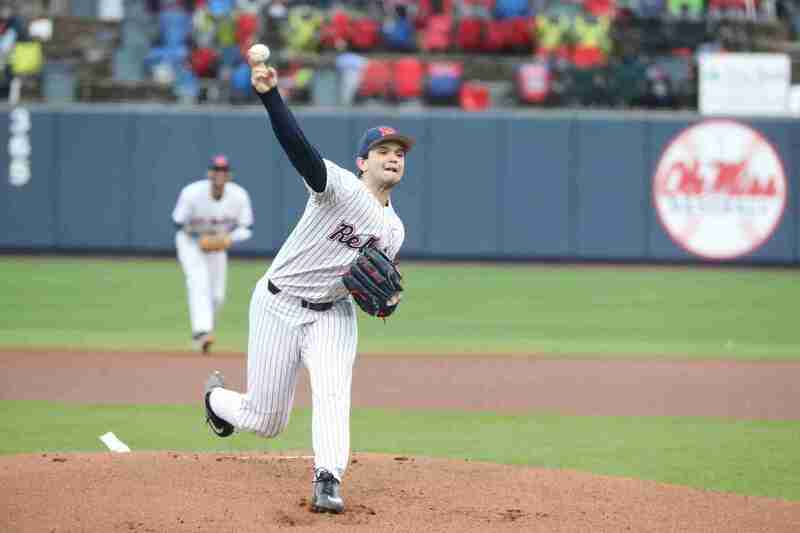 – Ole Miss returned to the baseball diamond at Swayze Field Wednesday evening—after the last two games were rained out—and soundly defeated Arkansas State, 15-3 to improve to 2-1 on the season. The biggest story coming into this evening’s game was the debut of Ole Miss pitcher Gunnar Hoglund. The freshman out of Hudson, Florida, who was drafted by the Pirates in the 1st-round of the MLB draft, gave up two early runs in the contest but quickly settled in and threw three-straight strikeouts to retire the side in the opening inning. Hoglund, who would’ve thrown Sunday had Game 3 against Wright State not been canceled due to weather, left the game with a stat line of 4 hits, 3 runs, 3 strikeouts, and one walk in 2.0 innings pitched. His pitch count was limited to just 28 so he can take the mound this Sunday against Tulane. Junior Houston Roth was slated to be the midweek starter in this opening week; however, his schedule was somewhat altered by the rainout. He pitched 2.0 innings against Arkansas State, giving up 1 hit, no runs, 1 walk and notching 4 strikeouts before handing the ball over to freshman, Doug Nikhazy. Roth picks up the win for the Rebels. Nikhazy put in one inning of work, giving up 2 hits, no runs, no walks and notching one strikeout in the process. He was followed by senior righty Connor Green who went 2.0 clean innings for the Rebs. Green’s stat line includes 2 hits, no runs, no walks and four strikeouts. Green handed the ball over to Jordan Fowler, and the lefty from Tennessee posted another clean inning for the Rebels, with no hits, no runs, no walks and one strikeout. Fowler was followed by Tyler Myers who closed out the game in the 9th with two strikeouts. 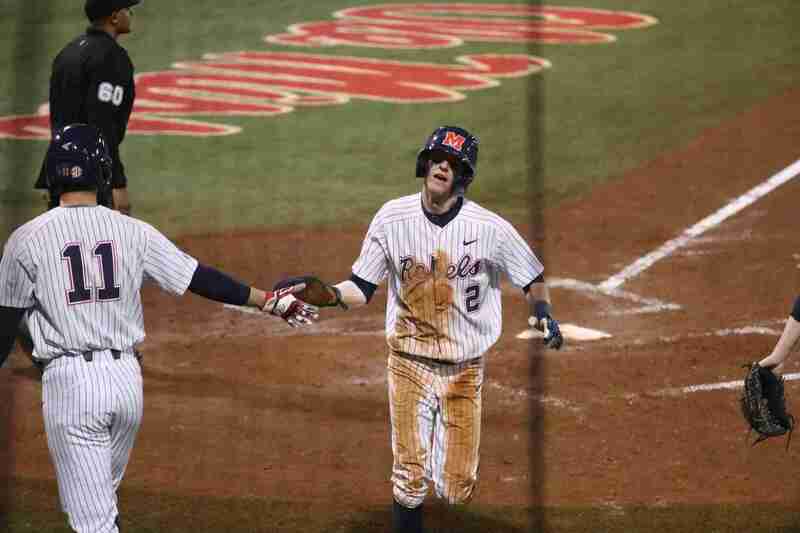 Overall, the Ole Miss staff gave up 10 hits on the evening but only gave up a total of three runs. The five Rebels who came out of the bullpen did their job on the mound and will be looked to as the season progresses. It was a very good night for the Ole Miss bats, to stay the least. Though they opened the game down 2-0 after the top half of the first, the Rebels plated five in the bottom of the inning, thanks to a Tyler Keenan 3-run homer and an RBI apiece from Ryan Olenek and Tim Elko. The game soon turned into a blowout. After scoring five runs in the first three innings, Ole Miss tallied another five runs in the 4th inning, four in the 5th, and one in the 6th. While Keenan and Thomas Dillard notched two huge homers, other performances of note include Grae Kessinger who went 3 for 4, Olenek who went 4 for 5, and Cole Zabowski who went 3 for 4. The Rebels hit the ball very well from the opening pitch and did not let up throughout much of the contest. Well-timed hitting with runners on base and a few sac-groundouts kept the runs scoring for the Ole Miss bats. One would think that a 2 for 4 night with a home run would be the main story for any player, but for Thomas Dillard his first collegiate start behind the plate earned more attention than his batting prowess. Dillard played very well in his role at catcher, a fact that should be a big comfort to head coach Mike Bianco and his squad as they have someone who can step into catching duties whenever necessary. Tyler Keenen wrapped up a 3 for 5 evening where he notched a career-best 5 RBI (now 7 on the season) and hit a monster 3-run blast in the 1st inning that spelled inevitable doom for the visiting Red Wolves. Ryan Olenek tied a career-high with four hits. Ole Miss batters had 19 hits on the day, the most since they had 21 against the Kentucky Wildcats in May of 2016. 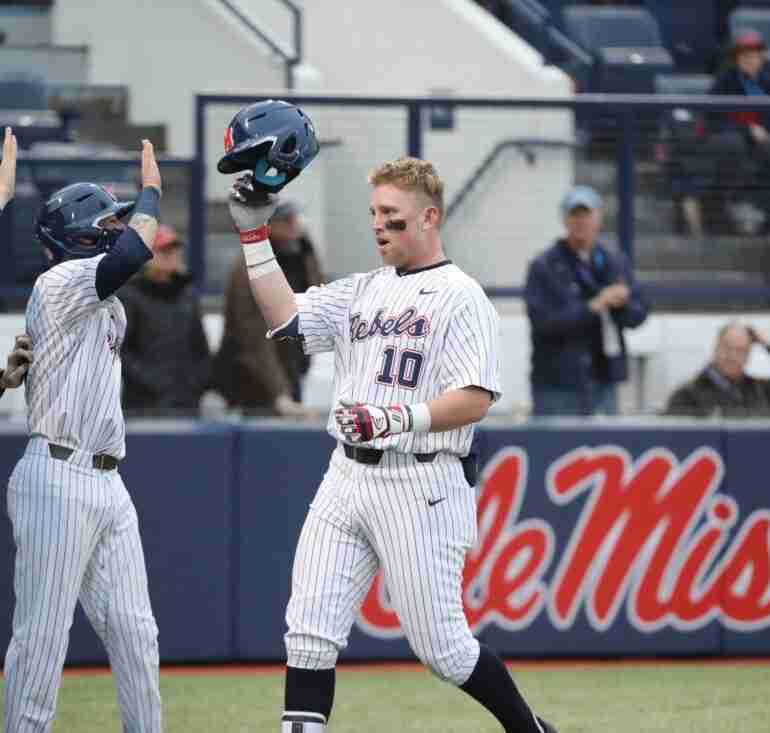 Eight Rebels entered the scorebook with a hit on the day, while seven recorded a run. The Rebels had four batters with three or more hits: Grae Kessinger, Tyler Keenan, Cole Zabowski, and Ryan Olenek. Ryan Olenek tied a career-high with four hits on the day, while Tyler Keenan recorded a new best with five RBI. Grae Kessinger tied his career-best with three runs on the day. Five Rebel pitchers combined for 13 strikeouts on the day. Carl Gindl recorded his first career hit today with a single up the middle in the fourth inning. Cole Zabowski stole his first base as a Rebel, as part of a double steal in the first inning. The Rebels also stole four bases as a team, the same as their first two games combined. A pair of freshman, Gunnar Hoglund and Doug Nikhazy, made their first career appearances in Wednesday’s game. This weekend Ole Miss takes its first road trip of the season as they head to New Orleans to face the Tulane Green Wave in a 3-game series February 22nd through the 24th. Due to a blister on the throwing hand of usual-Friday starter Will Ethridge, the weekend rotation will see Zack Phillips take the mound on Friday, Houston Roth on Saturday, and Gunnar Hoglund on Sunday. Ole Miss head coach Mike Bianco speaks with the media after the win over Arkansas State. Freshman pitcher Gunnar Hoglund made his first collegiate start for the Rebels. Pitcher Houston Roth earns the win for the Rebels over Arkansas State.